The word of the day is twins. I always thought it would be great to have twins for my next pregnancy. We're on the fence about wanting 4 or 5 children, and twins would be a great compromise. One pregnancy but two babies. Might as well go out with a bang, right? Surprise twin double breech roadside vaginal birth after cesarean. It's one of those stories that you almost wonder if it's made up! Home birth of "Radish" and "Broccoli" or "How the Veggies happened"
"You can't birth breech twins vaginally" -- wanna make a bet? Any other good twin stories out there? Please share! I really wanted twins right when I was at the point you're at. Two for the price of one! But, we've now had 4 and 5 ... no twins. Many years ago, I knew a Minnesota nurse-midwife who was also a member of the National Guard. She was in her uniform, ready to drive to her weekend service commitment, when her neighbor, pregnant with twins, went into labor. They called the ambulance, the nurse-midwife got in as well, and the woman delivered breech/breech twins in the back of the ambulance, attended by the nurse-midwife. A friedn recently had twins, her third and fourth babies, at home! Big babies too! Thanks for the links...adding them to the main post! I would LOVE it if I had twins, I would be absolutely over the moon!!!! It's long but worth a watch definitely!! My twins are my 5th and 6th babies and my only girls! They were by far my least comfortable pregnancy but are such a blessing in my life! They are the best of friends at age two and teach me more and more every day! And these stories are pretty awesome. I am just curious, given environmental concerns that involve a grease-oil car, why would you want 5 children? Why would I want joy? I don't think that being concerned about the environment means you have to only have a certain number of children. I get that some people will only have 1 or 2 (or none) because of environmental concerns but for me the joy and pleasure of raising children is a higher priority. What I'm trying to say is that I don't put those two concerns in the same equation. For me it's not an either-or construct. I nannied for a family who had twins for their final pregnancy (#4). It was really intense but this Mom was pretty incredible! 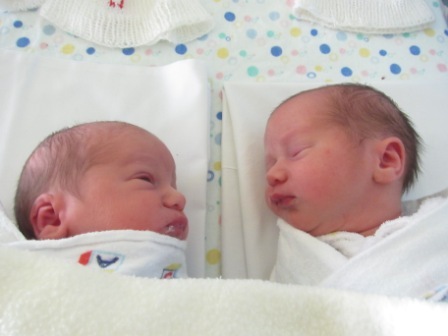 They were premature (32 weeks) and never got the hang of latching. So, she pumped for them for a year. Yes. Can you imagine? She taught me everything I know about breastfeeding, co-sleeping, etc. She had been intending to birth at home with her fourth but didn't feel comfortable doing it with twins. She did have a vaginal birth. :) Love your response to Anonymous. Children are GREAT JOY, especially two-for-one! I have long loved your blog and am loving your interest and desire for multiples! I admit I did not have that desire, and was totally terrified at first when we found out I was carrying twins. We were planning a homebirth and did not have a u/s scan until 20 weeks and were totally shocked to see two beautiful babies. Each with their own placenta and gestational sac, it was assumed they were fraternal. I had a really wonderful pregnancy with them, our oldest was 4 and our youngest 2 at the time. Our twin boys were finally born at 41 weeks and 3 days on my bedroom floor and it was the best day of my life. I loved breastgiving to two babies at a time, loving them has been the best experience, they are sweetest little guys and I cannot imagine our family without the both of them! We do have a hard time telling them apart sometimes, they turned out to be monozygotic, coming from one egg that split which I found fascinating to learn is more common the older you are and the more pregnancies you have had. Best of luck!! :) :) Here is their birth story. Thanks for all you write and share Rixa! I do not dispute that children are a great joy. I am a mother and agree wholeheartedly. But do more children=more joy? Why? You can't dispute that each and every extra human being is putting a huge tax on the earth. Even one extra child negates cloth diapering, greasy cars, low temp in the house, etc etc etc. Bill McKibben wrote a book "Maybe One" and it makes a whole lot of sense. I have no problem if you (anon) want to limit your family size...but I strongly disagree that there's some arbitrary family size that's Good and anything beyond that is Bad. If we really want to follow environmentalism to the extreme--and of course, I know this is a slippery slope argument--then shouldn't we have no children at all? Shouldn't we, at its most pure, even keep ourselves from living? I really resist the idea that a small family size (1-2-maybe 3 children) is okay but larger families are morally questionable. I don't deny that being aware of our footprint on the earth is important (hence the things I do personally) but I also don't use that calculus as my only variable for making decisions about my family relationships. Simply put, I disagree with your second paragraph. And yes, I would follow that argument to its end that maybe we should keep ourselves from having any children at all. We should really THINK about about questions of why and how many. What is the point of having babies anyway? It's always selfish in some form because nobody asks to be born. But on a less philosophical and more pragrmatic note, there is also a large middle ground between very large families, especially in the high-consumption West, and no children at all. That is the point I was trying to bring up. Replacement population versus higher than replacement. It is never as simple as Good and Bad, but it deserves consideration. Thank you for this post. I just found out that (surprise!) we're having twins. This is our last pregnancy and a wish fulfillment for me. As long as all continues well, they'll be born at home just like their other siblings.